For the past five years I’ve been coaching my kids and several of their classmates as they compete in the Destination Imagination (DI) challenge program. The program offers seven different open-ended challenges that allow kids to learn about creativity and innovation by experiencing the design process firsthand. This year’s program culminated last week at the global tournament in Nashville. One of the key tasks facing any DI coach each year is helping the team understand what type of thinking is called for at different parts during the challenge season. At the beginning of the season, the team needs to brainstorm as many different potential solutions as possible. Then, once they have a rough outline of what they want to accomplish, participants need to focus on executing their solution efficiently and creatively. By following the design process through divergent and convergent thinking they arrive at the tournament prepared to win. Work with our clients at Evantage also allows us to practice divergent and convergent thinking on a regular basis. Our clients often approach us with a need to design products, processes, or services that meet certain user needs or solve challenges facing a particular type of customer. 1) Warm up properly. To get folks comfortable with shouting out any idea that pops in their head, I often start with an “alphabet brainstorm.” In this exercise I hand a common household item—like a lightbulb, a pillowcase, or a birthday candle—to small teams of two or three people. I then give them three minutes to come up with 26 uses for the item, one for each letter of the alphabet. Once one person has shouted out something as silly as, “You could yodel into it!”, they’ll be ready to stop censoring all of their ideas before they make it out into the open. 2) Keep things moving. When facilitating an idea generation session, make sure each idea is brief. 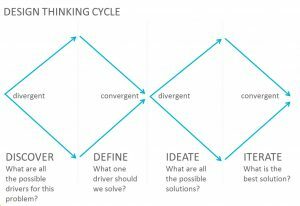 When one brainstormer starts elaborating and explaining her idea, it’s common for others in the room to converge around that solution and abandon their own divergent thinking efforts. For example, at a DI team meeting this fall, each member’s “pitch” for a mystery play the team would write and perform could only contain a two-word description of the time period, the names and professions of the three main characters, and a concise description of the crime that was committed. (It was like our own version of Professor Plum in the Library with the Lead Pipe!). 3) Level the playing field. Similarly, if one idea seems more “baked” than others, team members may focus on that idea at the exclusion of others too early in the process. Using design studio techniques or having team members sketch storyboards works well to force people to communicate their ideas at the same level of fidelity. 4) Quality is still king. Often, too much focus is placed on the sheer number of ideas generated during a brainstorm. Instead, look for a small number of truly novel ideas, or ways that traditional ideas could be combined in new and interesting ways. To encourage this, I lead the team in “pile on” brainstorming in which someone begins an idea and each person thereafter stretches it just a little bit further. For example, one person might say, “What if our vehicle had a rudder to steer?”; the next person might add, “Yes, and the rudder could be connected to a pair of handlebars”; and a third person might add, “We could mount a walkie talkie to the handlebars so the driver can easily talk to the navigator.” And so on. 1) Try it out. In many cases, hands-on experimentation and iteration are required to find the best solution (e.g., the walkie talkie won’t stay attached and if we just tape it on, we can no longer change the batteries, but we could build a holster from duct tape and cradle the walkie talkie in it). Have extra materials on hand so you can prototype ideas to see if they work, rather than just talking about them. Each time a production method doesn’t work, teammates must come together to think up new solutions to move forward (some of the same methods listed above may help). 2) Fail fast. Failing fast means doing the least amount of work you can do to find out if an idea is feasible or not. Don’t build an entire product when testing a prototype will tell you if meets the users’ needs, and don’t ever spend more than a week of working without testing something out. 4) Embrace project management. 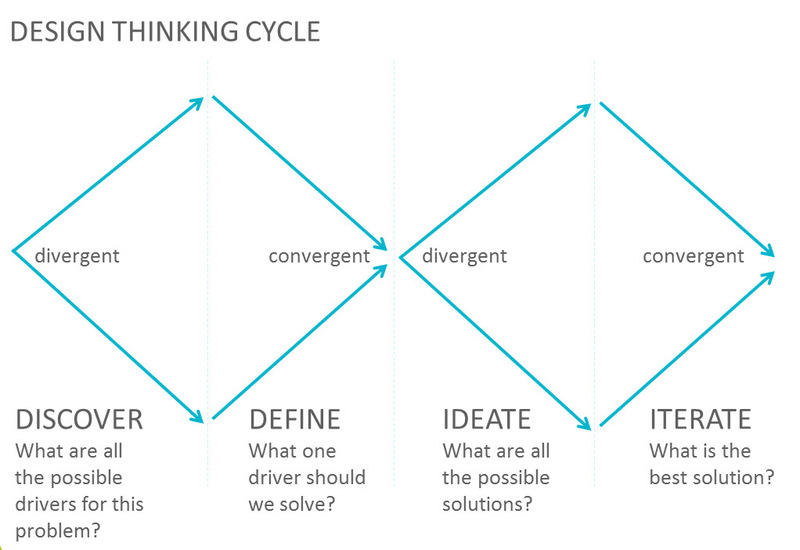 The basic tools for managing convergent thinking are well-known to most of us. Create a timeline with milestones, call out dependencies, and plan what materials and tools you will need along the way. This will ensure smooth progress from idea to solution. On launch day, or tournament day, it’s time to put it all out on the table and execute flawlessly. A team that has spent dedicated time in the first divergent and convergent thinking cycle can feel confident that they are solving a well-understood problem. If they’ve also practiced convergent and divergent thinking in the second cycle they will arrive with the absolute best solution possible. It’s time to celebrate by raising a cupcake or a pint of beer, as appropriate to your team’s age!